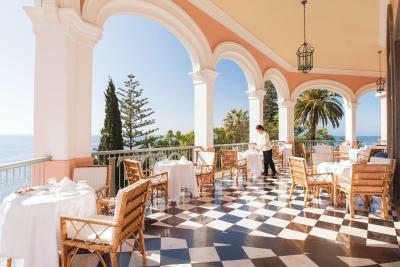 Lock in a great price for Belmond Reid's Palace - rated 9.4 by recent guests. Superb breakfast with huge choice; free water and soft drinks in room mini-bar; really comfortable bed; charming, old-fashioned but functional bathroom; wonderful view from room. The location is simply outstanding. It is a historic property, well kept. The staff is well trained and tries hard to please. The room we stayed in had elegant wallpaper coverings and furniture in a timeless English style. Great Ocean view. We had high tea a few times during our stay and were very happy with the experience. Dining in the hotel restaurants was also good. Lobby and public areas are well appointed and elegant in style. Staff were really caring and helpful. Attention to detail was excellent. Swimming pool lovely. Garden and sea gorgeous. Piano and singer in cocktail bar in evening great. Personal touch and generosity by management — we had a hand written letter of welcome and invited to a cocktail party. Interior and flowers and plants. Balcony and view, space and decor of our bedroom and bathroom. Breakfast buffet extensive choice. Friendly staff, excellent service, beautiful hotel and setting. 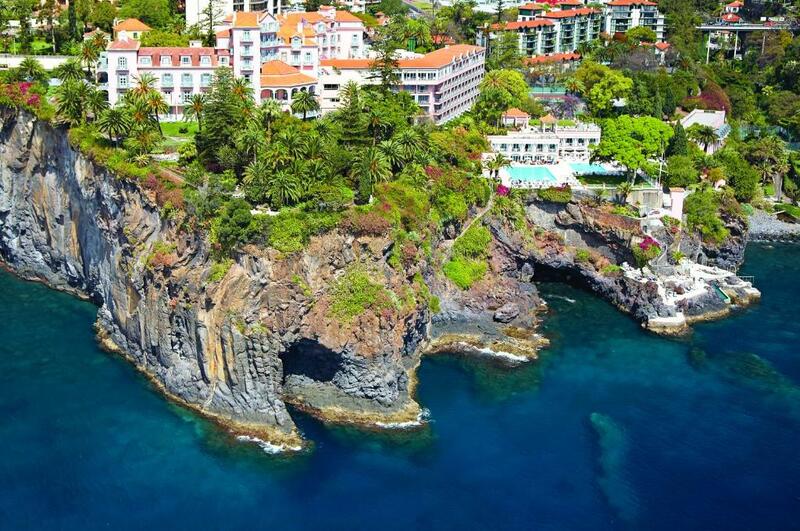 This is our second time visiting Madeira. Same hotel as last time. Familiar environment, nice room, pleasant service, wonderful food. The young lady with dark hair standing at the entrance of breakfast restaurant impressed us by her professionalism and her smile. The hotel is exceptional and unique. 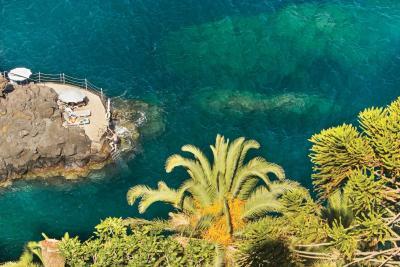 Fantastic views, gardens, swimming pools. Excellent staff. Bath and shower in classic rooms dated compared to a modern hotel. 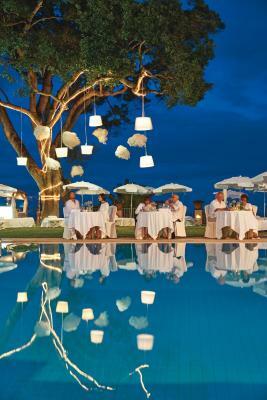 Classic atmosphere, location, pools, ample breakfast. Restaurant staff all struck a good balance between friendliness and professionalism, in particular we would commend Luis in William restaurant. 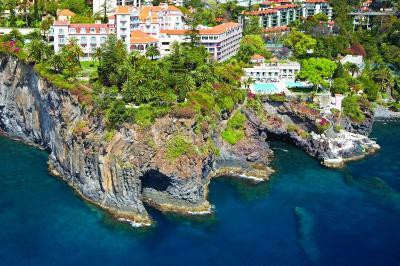 Madeira unexpectedly enjoyable with many things to do but without rush. The Breakfast is fantastic with good Vegan choices. The attention to detail in the hotel and by the staff is excellent. Fantastic location. Excellent facilities. Beautiful decor and wonderful historic photos throughout. The gardens are stunning - even better than the Jardim Botanico! 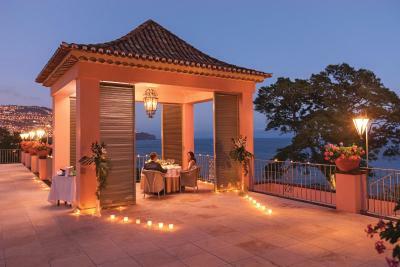 One of our top picks in Funchal.Set on a cliff in 10 acres of subtropical gardens overlooking the Atlantic, this 5-star resort features an oceanfront spa, 3 swimming pools and direct access to oceanic waters. 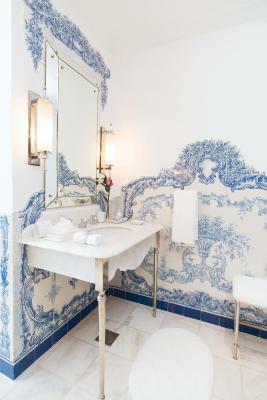 All rooms at Reid's Palace are elegantly furnished and include a balcony and marble bathroom with amenities. A minibar with complimentary drinks and free in-room movies are available to each room. Reid’s Palace Spa features indoor and outdoor therapy suites with a private whirlpool. It offers an indulgent menu of treatments using world-class spa brands. Dry and wet saunas are also on site. Active guests can play a match on the tennis courts, or get energised with cardiovascular equipment at the modern gym. 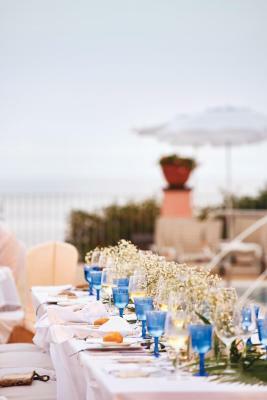 Al fresco dining is offered by the French-inspired Brisa Do Mar, while the Villa Cipriani serves classic Italian dishes. The Dining Room organises elegant soirees in Edwardian ambiance. 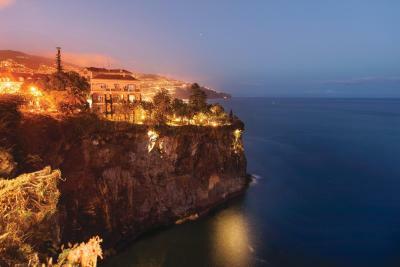 The Reid’s is 1.9 miles from Praia Formosa Beach and 15 minutes’ walk to Funchal city centre with plenty of nightlife. It provides free private parking. 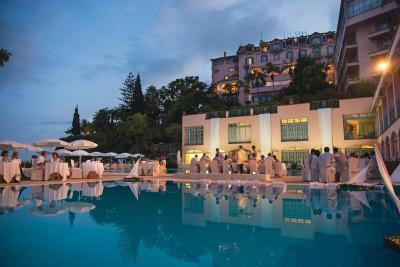 Belmond Reid's Palace has been welcoming Booking.com guests since 22 Mar 2010. 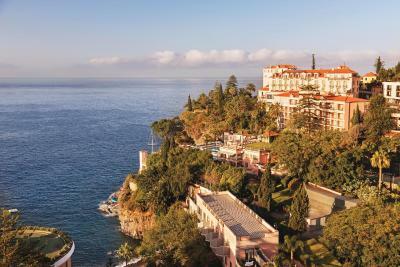 When would you like to stay at Belmond Reid's Palace? Charming Rooms are the smallest rooms designed for 2 persons and feature a king size bed. 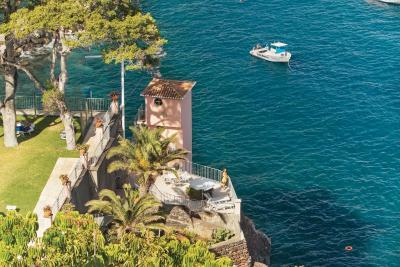 They have 18 square metres and offer a partial sea and garden view from a French balcony. 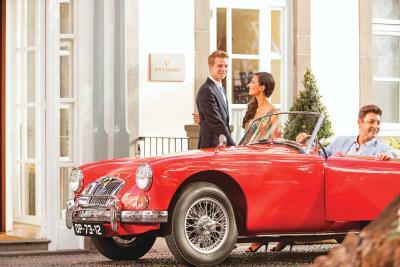 A welcome pack is provided, consisting of traditional Portuguese pastries and a welcome card. Spacious room with seating area and a private balcony offering partial sea views. 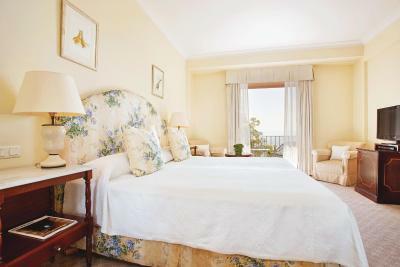 More spacious room featuring a marble bath and private balcony or patio with sea or garden views. 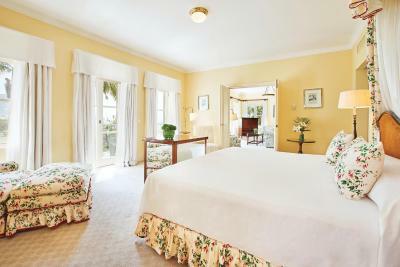 Large room featuring a spacious covered balcony or patio with ocean or garden views and a marble bathroom stocked with luxurious bathroom amenities. Each Junior Suite offers the guest an average of 37 square metres of living space with a sea view. These suites are offer large bedrooms, comfortable connected seating areas and well-appointed baths with separate showers and tubs. Please note that some suites are also available with twin beds (2 single beds instead of a very large double bed). Please indicate your preference when booking. Bed type is by request only and is not a guarantee. Superior Suites offer an average of 43 square metres of living space with private balconies with stunning sea or garden views. These suites offer large bedroom areas with a separate comfortable living areas and well-appointed baths with separate showers and tubs. 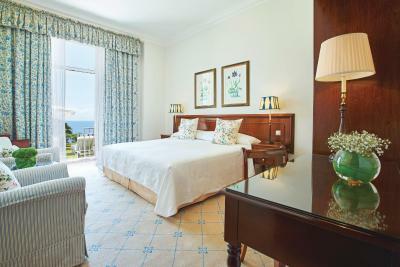 Each Deluxe Suite is divided into two rooms, providing views over the gardens and the ocean. It features a balcony, air conditioning and an iPod dock. The Presidential Suites feature Chinese hand-painted wallpapers and floor-to-ceiling windows. They offer views of gardens and the ocean. The separate bedroom and sitting room can be combined to create a two-bedroom suite. A balcony, a DVD player and air conditioning are offered. Hotel surroundings – This neighbourhood is a great choice for travellers interested in relaxation, nature and scenery – Check location Excellent location - show map Guests loved walking around the neighbourhood! 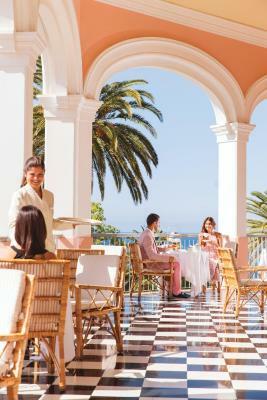 House rules Belmond Reid's Palace takes special requests - add in the next step! Bankcard Belmond Reid&#39;s Palace accepts these cards and reserves the right to temporarily hold an amount prior to arrival. Belmond Reid's Palace accepts these cards and reserves the right to temporarily hold an amount prior to arrival. Please note that some rooms feature wired internet instead of WiFi. Please note that the suites are either available with a very large double bed or with twin beds (2 single beds). Please indicate your preference when booking. Bed type is by request only and is not a guarantee. As a non-meat-eater, found the menus in all restaurants slightly limited. The weather could have been better. It is a bit expensive ( but then again it is a historic place etc) Most guests were 65+. It would have been nicer to share the place with a slightly younger crowd. I thought the spa was expensive and the list of treatments should have the prices displayed. Pure luxury with great service. No coffee making facilities in room. When I asked for them I was refused. The coffee served at breakfast was insipid though it was possible to ask for Nespresso instead. Having agreed an extended checkout of 30 minutes we returned within the agreed time to find our room stripped and full of cleaning staff. The food at the Terrace Bar was poor. It was tasteless and expensive for what it was. Pool shut too early - would have been nice to swim in the evening. The hotel is a mixture of old and new. First built in the 1880s I believe. But has nice new rooms that are all that is up to date. The view was wonderful and the afternoon tea in the terrace room a must.